BANGI, 24 September, 2010 – UKM’s Hari Raya do for its staff and students at the Dectar this morning was a memorable one especially for orphans and the original inhabitants of Bangi who joined in the festivities. A cheque-giving ceremony kicked off the feast with UKM Holdings Sdn Bhd, UKM Kesihatan Sdn Bhd and UKM Pakarunding Sdn Bhd handing over their tithes payment totalling RM179,000. The cheques were handed over by its Chairman Prof Datuk Ir. Dr Hassan Basri to the Vice Chancellor, Prof Tan Sri Dr Sharifah Hapsah Syed Hasan Shahabudin. 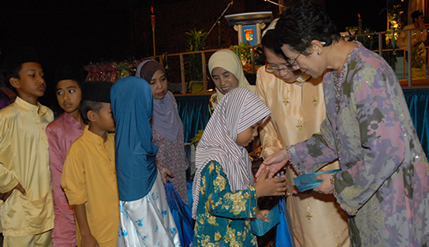 Children from two orphanages were also feted and given their ‘duit raya’. They are from the Sungai Pinang, Klang and Nur Hikmah, Kajang orphanages. Residents of two UKM adopted villages, Kampung Kundang Ulu Ledang, Johor and Kampung Pulau Manis, Pekan, Pahang were also present together with 20 original inhabitants of Bangi Lama. Apart from the lemang, rendang, lontong, sate and other traditional delicacies there were also other kuih including those made from tapioca, a favourite for many people.